For all these years I thought I was making bacalao a la vizcaína (salt cod, biscayne or vizcayan style), when I was really making a sort-of bacalao guisado (stewed salt cod)! I only found out yesterday, as I started soaking the cod for another Lenten Friday of fish. “Let me see how Valldejuli and Cabanillas make it,” I thought, referring to two classic Puerto Rican cooks whose recipes I have lived by over the years. I expected some inspiration for innovation, but what I got was comeuppance. I was so shocked by what I found that I checked Penelope Casas’ more Iberian, continental recipes for the dish. And it turns out that what I have been telling people is my “Bacalao a la vizcaína” is actually something else, but not quite. 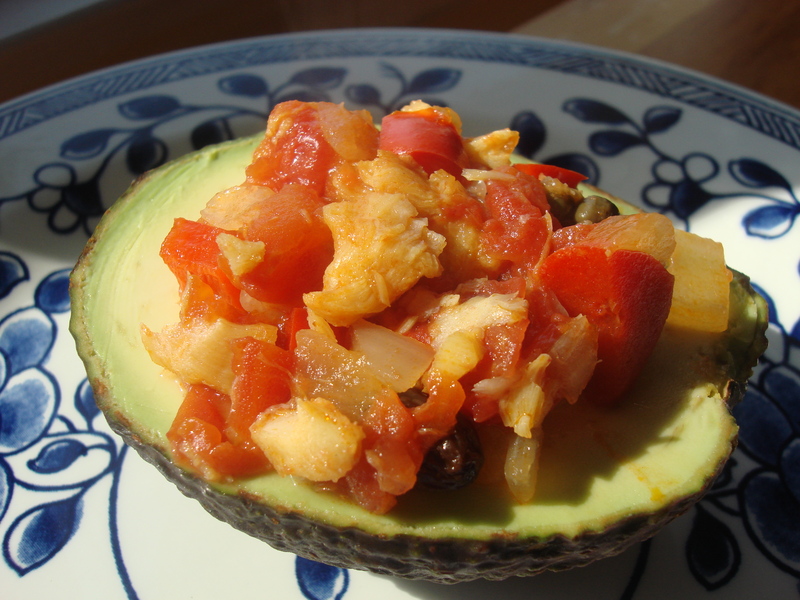 So, I am a little embarrassed, but nevermind, my bacalao dish is really good and easier than pie. It makes my parents happy. And, apparently, it is my own. Thus, the silly name change. I hope to try the real vizcaína later in Lent (it looks to be even easier than my version), but for now, this one is more than satisfactory and includes much of the same things: salt cod, onions, garlic, tomatoes, raisins, capers. It’s got salt, sweet and spice (if you like). It is rich without being heavy. This is a stew that goes well with rice, with potatoes (dressed with parsley and olive oil), with avocado and with hard-boiled eggs. It also goes well with Mark Kurlansky’s incredibly entertaining book Cod: A biography of the fish that changed the world which will enlighten you about why so many peoples in this world will go through the trouble of desalinating and cooking such a strong-tasting, strong-smelling fish. If you come from a seafaring nation, particularly bordering the Atlantic/in the Caribbean, it is part of you and you just can’t help it. Heat olive oil in a pot on high and add onion. Stir to coat, then lower heat to medium and sauté until wilted. Add peppers and garlic and sauté another five minutes or more, until translucent. Add the tomato and bring to a boil. Add cod (no need to break it up; it will fall apart in the cooking and stirring), raisins, capers and olives, lower heat and simmer (covered if it is not very liquid; uncovered if it seems very watery) for at least 20 minutes at a gentle bubble, stirring occasionally. Serve with you choice of accompaniments.